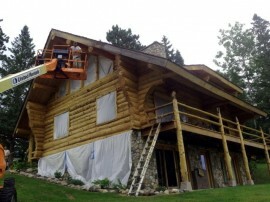 Log home maintenance tasks are typically done in the summer. Here at Edmunds, we are in full swing and we have been making tracks maintaining log homes all over Minnesota and Wisconsin. Lots of folks out there need a maintenance coat of stain applied or some caulk or chink repair, and then there are the countless other little “should does” before the snow flies. started on a project that needed maintenance in a serious way. Log home after blasting. Ready for staining. It is very important to fill in these log ends to prevent rot. These cracks or checks need caulking. This Eastern Red Cedar log cabin getaway is located near Grand Rapids in north central Minnesota. Because of the lack of maintenance over time, this house was vulnerable to water damage, specifically the top logs that most people never get a very close to look at. Other areas of concern were the hollow ends of the cedar logs that tend to rot because of how they grow in the forest. We spent time filling holes with chinking to further prevent water, bees, and bats from entering the home. Other larger critters like raccoons and squirrels can make their way into the roof and walls, as well. These preventative measures are imperative for the long life of your cabin. Most homeowners only get a few days each year to spend up at the lake cabin so during this time, it’s important to inspect the log cabin or home for problem areas. This year has brought several significant storms, including three storms in the upper Midwest that dumped ten to twenty inches of snow over the span of three weeks in the end of April and into May. 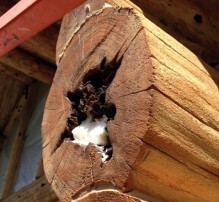 Cold temperatures and moisture will surely test the quality of the finish on any log home. Upward facing cracks (checks) can hold water for several weeks creating the perfect environment to quickly rot logs. On one occasion while I was working on a log home, I literally taped one log with a long 1/8 drill bit and water drained out of a log for several minutes. 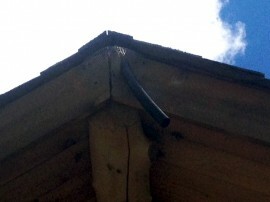 I made sure that the homeowner saw this perfect example of why we caulk upward facing checks in logs.